To Cite: Gay G, Ravera S, Castroflorio T, Garino F, Cugliari G, et al. Root Resorption in Mandibular Incisors During Orthodontic Treatment with Invisalign®: A Radiometric Study, Iran J Ortho. 2017 ; 12(1):e7915. doi: 10.17795/ijo-7915. Background: Existing literature indicates that orthodontics patients are more likely to have severe apical root shortening, interesting mostly maxillary, followed by mandibular incisors. Objectives: The aim of the present study was to investigate the incidence and severity of root resorption (RR) in mandibular incisors of adult patients treated with aligners. Methods: The study group consisted of 71 adult healthy patients (mean age 32.8 ± 12.7) treated with aligners (Invisalign®, Align Technologies, San Jose, CA, USA) for the intrusion of the lower incisors. Root and crown lengths of a total of 279 lower incisors were measured in panoramic radiographs at the beginning (T0) and at the end (T1) of aligner therapy. Individual root-crown-ratio (RCR) of each tooth and therefore the relative changes of RCR (rRCR) were determined. Results: 44% of the 279 measured teeth presented a reduction of the pre-treatment root length. A reduction in percentage of > 0% up to 10% was found in 26.76% (n = 76), a distinct reduction of > 10% up to 20% in 12.32% (n = 35) of the sample. 4.58% (n = 13) of the teeth were affected by a clinically relevant reduction (> 20%). Conclusions: Orthodontic treatment with Invisalign® aligners could led to RR in cases in which intrusion of the lower incisors is planned. However, the incidence of RR is comparable to data described in case of application of light forces with fixed appliances, and considerably lower than what has been described for traditional comprehensive orthodontic treatments. Root resorption (RR) is described as a permanent loss of tooth structure from the root apex and its clinical manifestation among orthodontic patients is highly variable (1). The etiopathogenesis of RR is complex and multifactorial, and influenced by individual biologic variability, genetic predisposition and mechanical factors (2). As a matter of fact, several authors demonstrated that RR occurs even without orthodontic treatment (3-6). However the existent literature shows that orthodontically treated patients are more likely to have severe apical root shortening (7). The occurrence of RR in orthodontically moved teeth is reported as greater than 90% in histological studies (8-10). Lower percentages are reported when diagnostic radiographic techniques are used. The average amount of tissue loss is usually less than 2.5 mm (11-14) or varies from 6 to 13% for different teeth in radiographic studies (15). RR is usually classified as minor or moderate in most orthodontic patients. Severe resorption, if exceeding 4 mm or one - third of the original root length, is seen in 1 - 5% of teeth 7 (7, 16-18). The mechanism of root resorption has two phases: the first is represented by the damage of the external surface of the root with exposition of denuded mineralized tissue while the second phase is characterized by the stimulation of multinucleated cells (19). Those multinucleated cells colonize the denuded mineralized tissue and initiate the resorption process. If there are no further stimulations, spontaneous repair will occur with cementum - like material within 2 - 3 weeks. If the inflammatory process will persist involving deeper root dentin, then RR can be detected radiographically (20). Apical RR may be observed during or at the end of the treatment. It begins approximately 2 - 5 weeks into treatment, but it takes 3 - 4 months before radiographical appearance. Even if it is a complex biological process and many aspects are unknown, RR occurs when forces at the root apex exceed the resistance and reparative ability of the periapical tissues. Furthermore the association between the amount of orthodontic tooth movement and the resulting RR, has been demonstrated (21-24). The amount of tooth movement depends on the severity of the malocclusion, suggesting that the presence of a severe malocclusion represents a risk factor for RR. Class I patients with acceptable overjet show less RR than Class II or III patients (25). Several studies, suggest that the pause in orthodontic treatment conducted with intermittent force allows the resorbed cementum to heal and prevent further resorption (26-28). Since the Invisalign® treatment technique belongs to removable appliances, intermittent forces are applied to the teeth. The aim of the present study was to investigate the incidence and severity of RR in mandibular incisors of adult patients treated with aligners in order to obtain their intrusion. The study was conducted to answer the following clinical question: does the lower incisors intrusion obtained with interrupted forces result in RR? In the present study we evaluated 71 (25 males and 46 females) adult healthy patients treated with aligners (Invisalign®, Align Technologies, Santa Clara, CA, USA). The mean age was 32, 8 ± 12.7 (age range 18-71). The panoramic radiographs were taken at the beginning (T0) and at the end (T1) of orthodontic treatment. The average treatment duration was 18 months. All of the pre- and post- panoramic radiographs were taken with the same device. Inclusion criteria for all the patients were: need for intrusion of the lower incisors, moderate crowding (arch length discrepancy < 6 mm). Exclusion criteria were: evidence of root resorption on the pre-treatment panoramic radiographs, presence of severely dilacerated roots or endodontically treated teeth, patients requiring other orthodontic systems, extraction therapy or any surgical treatment. The treatment plan was designed in order to obtain an intrusion movement of the lower incisors. All lower incisors were assessed. Considering inclusion and exclusion criteria, a total of 279 teeth were evaluated (Table 1). The measurement of the dental panoramic radiographs were performed by using Orisceph (Orisceph Rx®, Elite Computer Italia, Vimodrone, MI, Italy). On the basis of Krieger et al., Fritz et al. and Linge and Linge, all root and crown measurements were assessed by one examiner blinded in a stochastic sequence (11, 29, 30). To evaluate the pre- and post-treatment root length a symmetric cross was defined by two connecting lines: the first from the width of the incisal edge of the tooth to the apex, the second from the mesial and distal edge of cemento-enamel-junction. The crown length was represented by the distance between incisal edge and cemento-enamel-junction (on the long axis). The root length was represented by the distance between cemento-enamel-junction and apex (Figure 1). Figure 1. Measurement of the Panoramic Radiographs: Root and Crown Lengths (CEJ = Cemento-Enamel Junction), Individual root-crown-ratio (RCR) was determined considering pre- and post-treatment root and crown length. As stated by Krieger et al. (25) and Fritz et al. (31) individual root-crown-ratio (RCR) of each tooth and therefore the relative changes of RCR (rRCR) was determined considering pre- and post-treatment root and crown length. An rRCR of 100% indicates no change of the pre-treatment root length relative to the post-treatment root length. A decrease of rRCR indicates a reduction of the root length during treatment. Data analysis and data collection were performed using the SPSS® software program (statistical package for social science) for windows version 23.0 (Inc., Chicago, II, USA). The averages of the two measurements were used to calculate RCR and the changes in RCR. Absolute and relative frequencies of RCR were calculated for every tooth. Quantitative measurements are described by mean and standard deviation. For testing difference in RCR between right and left side of the arch we performed a student’s T-test for paired sample. 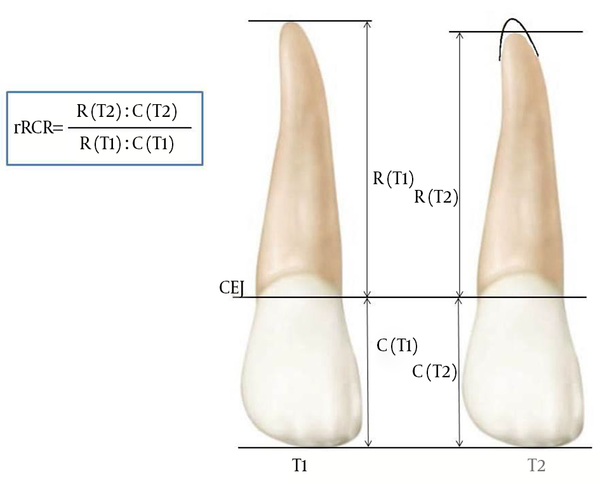 The mean rRCR for every tooth is shown in Table 2. All patients had a minimum of one teeth affected with a reduction of the root length (rRCR < 100%), on average 2.14 ± 0.92 teeth per patient (Table 3). In the present study, 43.66% of the 279 teeth (n = 124) were affected by reduction of the post-treatment root length (rRCR < 100%). Considering the severity of the RR, a reduction in percentage of > 0% up to 10% was found in 26.76% (n = 76), a distinct reduction of > 10% up to 20% in 12.32% (n = 35) of the sample. 4.58% (n = 13) of the teeth were affected with a considerable reduction (> 20%) (Table 4). Table 4. Distribution of the root length reduction during orthodontic treatment. Post-treatment RCR relative to pre-treatment RCR (rRCR), absolute (n) and relative (%) frequencies ( n=279): r RCR < 80 means a reduction over 20 % of pre-treatment root length. The values of the individual tooth (32-35) are shown in Table 5. Table 5. Distribution of the root length reduction during orthodontic treatment of the individual teeth (each n = 68 ± 3, overall n = 279): post-treatment RCR relative to pre-treatment RCR (rRCR), absolute (n) and relative (%) frequencies. The difference in rRCR between right and left side of the arch was also tested by using a Student’s t-test for paired sample. Every tooth on the right side of the arch was compared with the corresponding on the left side. Lower central incisors showed a statistically significant difference between RR on the right side and on the left side of the arch (Table 6). Table 6. Lower incisor tooth on the right side of the arch was compared with the corresponding on the left side using Welch Two Sample t-test. Estimate shows the mean of the differences. aP value < 0.05. 41-31 showed a statistically significative difference. In previous studies it has been demonstrated that maxillary incisors showed a consistent average apical root resorption, more than any other analyzed tooth, followed by mandibular incisors and mandibular first molars (12, 23-25, 31-33, 36-39). As shown in Table 2,43.66% of the 279 teeth (n = 124) were affected by post-treatment reduction of the root length with aligner therapy. These data are encouraging if compared to the ones recently reported by Castro et al. (40); in their study the incidence of RR in patients treated with straight wire appliances was 72% for mandibular central incisors and 70% for mandibular lateral incisors. Tieu et al. (41) in their systematic review evaluated RR to maxillary and mandibular incisors during non-surgical orthodontic treatment (extraction and non-extraction) in class II division I malocclusions, measured using radiographs (periapical or lateral cephalometric). Each study classified root resorption differently; however, all reported that the majority of teeth experienced mild to moderate resorption following treatment. Prevalence of incisors root resorption ranged between 65.6% and 98.1%. When considering the severity of RR in our study sample, the incidence of minimal RR (< 10%) was 27%, mild RR (between 10% and 20%) was 12% and severe RR (between 10% and 20%) was only 4.58%. These values are consistent with those reported in a retrospective study of Krieger et al. (29) who examinated the incidence and severity of RR in patients who underwent a fully implemented orthodontic treatment with aligners: 46% of all teeth presented RR; in particular mandibular incisors showed a minimal RR ranged from 25% to 32%, mild RR from 11% to 18% and severe RR from 1% to 14%. The major incidence of RR in maxillary and mandibular incisors may be explained with the greater extending of movement of maxillary incisors that usually occurs, the root structure of the incisors, and its relationship to bone and the periodontal membrane, which transfers most of the forces to the apex (34). As far as the force system applied to teeth is concerned, a comprehensive orthodontic treatment causes increased incidence and severity of RR, and heavy force application significantly produces a greater RR than light force application or control1 (1). Therefore, the use of light forces, especially for intrusion of anterior teeth, is recommended. It has been suggested that an orthodontic force greater than the partial pressure of the periodontal capillaries (26 g per square centemeter) (35) will cause periodontal ischemia and lead to RR. In their prospective study, Barbagallo et al. (42) used x-ray microtomography to quantify premolar cementum resorption generated by treatment with ClearSmile® (ClearSmile, Woollongong, Australia) aligners: these values obtained were compared with the ones of a fixed appliance generating heavy or light orthodontic forces. The results showed that the aligner group had a similar RR with respect to the light-force group and approximately six times greater than the untreated control group. Similar results between the aligners group and the light-force group could be explained by the study conducted by Cattaneo et al. in 2009 (43). In their finite element analysis the PDL performance under light force loading was evaluated. The authors did not confirm the classical ideas of distinct and symmetrical compressive and tensile areas in the periodontium: light continuous orthodontics forces are perceived as intermittent by the periodontium, because of the viscoelastic nature of PDL and of the vertical forces released during function and parafunction. This finding could explain the similar results between the aligners group and the light-force group. Orthodontic treatment with Invisalign® aligners could led to RR in cases in which intrusion of the lower incisors is planned. However the incidence of RR results comparable to what has been described for the application of orthodontic light forces, with in most of the cases a percentage of RR < 10% of the original root length, and considerably lower than what has been described for comprehensive orthodontic treatments. The present study investigated the incidence and severity of RR in mandibular incisors of adult patients treated with aligners during Class II treatments with sequential distalization protocol applied on the upper arch and intrusion in the lower incisors area. Every patient showed a minimum of one teeth with root length reduction. On average, 2.14 teeth per patient were affected. Overall, 44% of the measured 279 teeth showed signs of apical root resorption, but only 4.58% a reduction of over 20% of the pre-treatment root length. Financial Disclosure: The Authors declare to have no financial interests related to the contents of the manuscript. 1. Weltman B, Vig KW, Fields HW, Shanker S, Kaizar EE. Root resorption associated with orthodontic tooth movement: a systematic review. Am J Orthod Dentofacial Orthop. 2010;137(4):462-76. discussion 12A. doi: 10.1016/j.ajodo.2009.06.021. [PubMed: 20362905]. 2. Al-Qawasmi RA, Hartsfield JJ, Everett ET, Flury L, Liu L, Foroud TM, et al. Genetic predisposition to external apical root resorption in orthodontic patients: linkage of chromosome-18 marker. J Dent Res. 2003;82(5):356-60. [PubMed: 12709501]. 3. Al-Nazhan S. External root resorption after bleaching: a case report. Oral Surg Oral Med Oral Pathol. 1991;72(5):607-9. [PubMed: 1745520]. 4. Counts AL, Widlak RA. Generalized idiopathic external root resorption. J Clin Orthod. 1993;27(9):511-3. [PubMed: 8308164]. 5. Rivera EM, Walton RE. Extensive idiopathic apical root resorption. A case report. Oral Surg Oral Med Oral Pathol. 1994;78(5):673-7. [PubMed: 7838479]. 6. Snelgrove RA. Generalized idiopathic apical root resorption as an incidental finding in an adolescent: a case history. Dent Update. 1995;22(7):276-8. [PubMed: 8948209]. 7. Killiany DM. Root resorption caused by orthodontic treatment: an evidence-based review of literature. Semin Orthod. 1999;5(2):128-33. [PubMed: 10530286]. 8. McLaughlin KD. Quantitative determination of root resorption during orthodontic treatment. Am J Orthod. 1964;50(2):143. doi: 10.1016/0002-9416(64)90127-7. 9. Stenvik A, Mjor IA. Pulp and dentine reactions to experimental tooth intrusion. A histologic study of the initial changes. Am J Orthod. 1970;57(4):370-85. [PubMed: 5265007]. 10. Harry MR, Sims MR. Root resorption in bicuspid intrusion. A scanning electron microscope study. Angle Orthod. 1982;52(3):235-58. doi: 10.1043/0003-3219(1982)052<0235:RRIBI>2.0.CO;2. [PubMed: 6959549]. 11. Linge BO, Linge L. Root length of upper canines and orthodontic therapy [in German]. Fortschr Kieferorthop. 1983;44(5):392-407. [PubMed: 6583148]. 12. Linge L, Linge BO. Patient characteristics and treatment variables associated with apical root resorption during orthodontic treatment. Am J Orthod Dentofacial Orthop. 1991;99(1):35-43. doi: 10.1016/S0889-5406(05)81678-6. [PubMed: 1986524]. 13. Mirabella AD, Artun J. Risk factors for apical root resorption of maxillary anterior teeth in adult orthodontic patients. Am J Orthod Dentofacial Orthop. 1995;108(1):48-55. [PubMed: 7598104]. 14. Mavragani M, Boe OE, Wisth PJ, Selvig KA. Changes in root length during orthodontic treatment: advantages for immature teeth. Eur J Orthod. 2002;24(1):91-7. [PubMed: 11887384]. 15. Blake M, Woodside DG, Pharoah MJ. A radiographic comparison of apical root resorption after orthodontic treatment with the edgewise and Speed appliances. Am J Orthod Dentofacial Orthop. 1995;108(1):76-84. [PubMed: 7598108]. 16. Lupi JE, Handelman CS, Sadowsky C. Prevalence and severity of apical root resorption and alveolar bone loss in orthodontically treated adults. Am J Orthod Dentofacial Orthop. 1996;109(1):28-37. [PubMed: 8540480]. 17. Levander E, Malmgren O. Evaluation of the risk of root resorption during orthodontic treatment: a study of upper incisors. Eur J Orthod. 1988;10(1):30-8. [PubMed: 3162877]. 18. Levander E, Malmgren O, Stenback K. Apical root resorption during orthodontic treatment of patients with multiple aplasia: a study of maxillary incisors. Eur J Orthod. 1998;20(4):427-34. [PubMed: 9753824]. 19. Trope M. Root resorption of dental and traumatic origin: classification based on etiology. Pract Periodontics Aesthet Dent. 1998;10(4):515-22. [PubMed: 9655059]. 20. Fuss Z, Tsesis I, Lin S. Root resorption--diagnosis, classification and treatment choices based on stimulation factors. Dent Traumatol. 2003;19(4):175-82. [PubMed: 12848710]. 21. Parker RJ, Harris EF. Directions of orthodontic tooth movements associated with external apical root resorption of the maxillary central incisor. Am J Orthod Dentofacial Orthop. 1998;114(6):677-83. [PubMed: 9844208]. 22. Fox N. Longer orthodontic treatment may result in greater external apical root resorption. Evid Based Dent. 2005;6(1):21. doi: 10.1038/sj.ebd.6400304. [PubMed: 15789049]. 23. Newman WG. Possible etiologic factors in external root resorption. Am J Orthod. 1975;67(5):522-39. [PubMed: 164774]. 24. Kook YA, Park S, Sameshima GT. Peg-shaped and small lateral incisors not at higher risk for root resorption. Am J Orthod Dentofacial Orthop. 2003;123(3):253-8. doi: 10.1067/mod.2003.81. [PubMed: 12637897]. 25. Kaley J, Phillips C. Factors related to root resorption in edgewise practice. Angle Orthod. 1991;61(2):125-32. doi: 10.1043/0003-3219(1991)061<0125:FRTRRI>2.0.CO;2. [PubMed: 2064070]. 26. Acar A, Canyurek U, Kocaaga M, Erverdi N. Continuous vs. discontinuous force application and root resorption. Angle Orthod. 1999;69(2):159-63. doi: 10.1043/0003-3219(1999)069<0159:CVDFAA>2.3.CO;2. [PubMed: 10227557]. 27. Reitan K. Effects of force magnitude and direction of tooth movement on different alveolar bone types. The Angle Orthod. 1964;34(4):244-55. 28. Dougherty HL. The effect of mechanical forces upon the mandibular buccal segments during orthodontic treatment. Am J Orthod. 1968;54(2):83-103. [PubMed: 5235977]. 29. Krieger E, Drechsler T, Schmidtmann I, Jacobs C, Haag S, Wehrbein H. Apical root resorption during orthodontic treatment with aligners? A retrospective radiometric study. Head Face Med. 2013;9:21. doi: 10.1186/1746-160X-9-21. [PubMed: 23941626]. 30. Fritz U, Diedrich P, Wiechmann D. Apical root resorption after lingual orthodontic therapy. J Orofac Orthop. 2003;64(6):434-42. doi: 10.1007/s00056-003-0243-5. [PubMed: 14628135]. 31. Harris EF, Kineret SE, Tolley EA. A heritable component for external apical root resorption in patients treated orthodontically. Am J Orthod Dentofacial Orthop. 1997;111(3):301-9. [PubMed: 9082853]. 32. Goldson L, Henrikson CO. Root resorption during Begg treatment; a longitudinal roentgenologic study. Am J Orthod. 1975;68(1):55-66. [PubMed: 1056144]. 33. Malmgren O, Goldson L, Hill C, Orwin A, Petrini L, Lundberg M. Root resorption after orthodontic treatment of traumatized teeth. Am J Orthod. 1982;82(6):487-91. [PubMed: 6961819]. 34. English H. External apical root resorption as a consequence of orthodontic treatment. J N Z Soc Periodontol. 2001;(86):17-23. [PubMed: 11862917]. 35. Schwarz AM. Tissue changes incidental to orthodontic tooth movement. Int J Orthod Oral Surg Radiography. 1932;18(4):331-52. 36. Kennedy DB, Joondeph DR, Osterberg SK, Little RM. The effect of extraction and orthodontic treatment on dentoalveolar support. Am J Orthod. 1983;84(3):183-90. [PubMed: 6577790]. 37. Janson GR, De Luca Canto G, Martins DR, Henriques JF, De Freitas MR. A radiographic comparison of apical root resorption after orthodontic treatment with 3 different fixed appliance techniques. Am J Orthod Dentofacial Orthop. 2000;118(3):262-73. doi: 10.1067/mod.2000.99136. [PubMed: 10982926]. 38. Sameshima GT, Sinclair PM. Predicting and preventing root resorption: Part I. Diagnostic factors. Am J Orthod Dentofacial Orthop. 2001;119(5):505-10. doi: 10.1067/mod.2001.113409. [PubMed: 11343022]. 39. Brin I, Tulloch JF, Koroluk L, Philips C. External apical root resorption in Class II malocclusion: a retrospective review of 1- versus 2-phase treatment. Am J Orthod Dentofacial Orthop. 2003;124(2):151-6. doi: 10.1016/S0889540603001665. [PubMed: 12923510]. 40. Castro IO, Alencar AH, Valladares-Neto J, Estrela C. Apical root resorption due to orthodontic treatment detected by cone beam computed tomography. Angle Orthod. 2013;83(2):196-203. doi: 10.2319/032112-240.1. [PubMed: 22812378]. 41. Tieu LD, Saltaji H, Normando D, Flores-Mir C. Radiologically determined orthodontically induced external apical root resorption in incisors after non-surgical orthodontic treatment of class II division 1 malocclusion: a systematic review. Prog Orthod. 2014;15:48. doi: 10.1186/s40510-014-0048-7. [PubMed: 25139200]. 42. Barbagallo LJ, Jones AS, Petocz P, Darendeliler MA. Physical properties of root cementum: Part 10. Comparison of the effects of invisible removable thermoplastic appliances with light and heavy orthodontic forces on premolar cementum. A microcomputed-tomography study. Am J Orthod Dentofacial Orthop. 2008;133(2):218-27. doi: 10.1016/j.ajodo.2006.01.043. [PubMed: 18249288]. 43. Cattaneo PM, Dalstra M, Melsen B. Strains in periodontal ligament and alveolar bone associated with orthodontic tooth movement analyzed by finite element. Orthod Craniofac Res. 2009;12(2):120-8. doi: 10.1111/j.1601-6343.2009.01445.x. [PubMed: 19419455].